Kofi and McMahon had a grappling match backstage! Who said father time can’t be conquered? The godfather of WWE has seemingly done that too! Vince McMahon, at 73 years old, is still the hands-on promoter that took a pro wrestling company from the territories to a global platform, and, has preserved its monopolistic status for decades. The WWE Boss may attract a fair share of hate for his apparent stubbornness in altering the so-called product, but you can’t deny his genius. He is a mastermind with a true obsession for telling stories. McMahon has meticulously crafted a web of operations to ensure the incredibly vast WWE remains a tight ship however sluggish it may seem at times. He is a shrewd businessman, a workaholic, and often, a brutally savage boss to have. Working under Vincent Kennedy McMahon, thus, has its own merits and demerits. While he can be a vibrant leader, he can also be a talent’s worst nightmare if things go awry. Surprised to see good guy Kofi on the list? The New Day member is currently at the height of his relevancy but that wasn’t always the case. Chris Jericho revealed an interesting backstage story in his book ‘Best in the World (At What I Have No Idea) and the surprising protagonists were Kingston and McMahon. It should be noted that this happened during Kinston’s early days with the WWE. 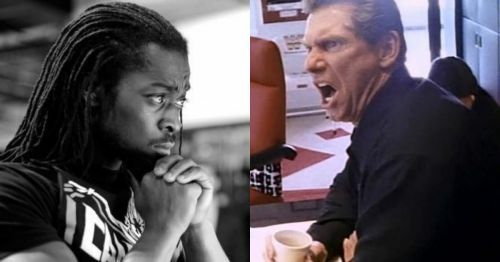 While on a plane ride, McMahon was at his confrontational best as he made a comment to Kofi. McMahon said, “Maybe one day you’ll get over.” Kingston was not a happy man but gulped his anger down until Jericho ruffled a few feathers. Y2J told Kingston to get back at McMahon and challenge him to a fight. Kingston initially thought of it to be a harmless joke but Y2J somehow convinced him that McMahon was indeed serious. Kofi manned up and confronted McMahon by asking him whether they had a problem. A verbal argument ensued before a sneaky double leg takedown attempt from the WWE boss. For the next few minutes, Kingston and McMahon grappled on the ground. Yes, you heard that right! The fracas ended after McMahon got back to his feet and comically subdued the incident. McMahon was impressed by Kofi’s decision to stand up to up him and it all ended with the much-needed mutual respect.